—or for those who are and like it." "Thompson shines at using unexpected or multiple perspectives to breathe new life into conventional tales, with story endings that are surprising and skillfully foreshadowed. This balance between the unpredictable and the expected rewards rereading." "Excellent sick little work of art." It's a little twisted, as you can imagine, and it will probably do some damage to your brain, as you might expect. And it's been getting some great reviews and even went and won itself a couple Purple Dragonfly Book Awards. you can watch the trailer for the book on this page. 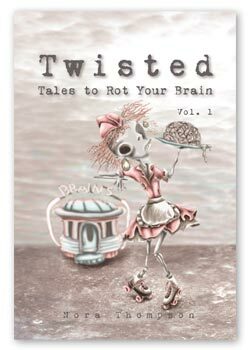 The book collects together 28 flash fiction stories that target anybody who giggles when a story takes a surprising turn, from middle grade readers through their adult counterparts. The stories in the collection unfold using traditional text, illustrated text, text with illustrations, stand-alone illustrations and even a graphic novel. Well, if you buy the book directly from me, I'll sign it and send it off with a free bookmark and a pat on its little head. Just click the "buy now" button below. If you would like it personalized, just let me know in the "Add special intructions to the seller" box during checkout. And no worries: I use PayPal, so your transaction is completely secure. The book is also available at Amazon (the link is over there on the left) and Barnes & Noble (hardcover | paperback) as well as various other wonderful online entities, in both hardcover and paperback. The book has gotten some great reviews (Publishers Weekly, Midwest Book Review and Kirkus Reviews, to drop a few names), and Kirkus Reviews even made it their Indie Spotlight Q&A! The Hairy Eyeballs shop is up and running, so you can find some of the illustrations from the book on merchandise over there at Zazzle. I do have a few images, sample stories and instigations on the extras page, and some background info on the about page. If you want to get more in-depth stories about the book, take a click on the blog. It has some in-progress posts, and I'll be sliding in some tidbits there that you won't be able to find anywhere else. Hopefully you have a twisted sense of humor, otherwise this relationship is probably already over. But if you're liking what you see, keep checking back as I swap out illustrations for fresh ones as they are finished. And thanks a cryptload for reading this far.